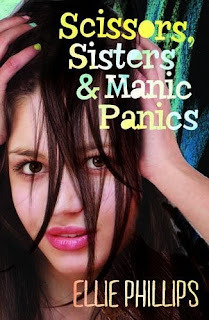 Today I am very happy to introduce both Ellie Phillips, the author of Scissors, Sisters and Manic Panics (sequel to Dads, Geeks and Blue-Haired Freaks) to the blog today along with Sadie Nathanson, the lovely star of the series to talk about summer hairstyles. I have to admit, I quite fancy that two-strand braid. “Okay, just so you know; I am a total hair geek. My cousin Billy is a geek fullstop; guitars, World of Warcraft – you name it he’s obsessed, so I reckon it’s something in the genes, right? Anyway, being a hair geek the first thing I think when I see someone is ‘okay – what’s with the hair?’ And that can be anybody; Barack Obama, The Queen, that woman opposite me on the bus, nobody is exempt from my scrutiny so watch out…. First impressions: it’s looking big and shaggy. The word is ‘natural’ this summer. There’s ombre, shaggy bobs and my weird boss, Dariusz, says that twisting is very now. If you’re a long-term hair geek like me then you’ll notice that ‘natural’ is a big contrast to that dead straight hair I was still doing last year – which personally I thought made some people look like drowned rats. 2. Ashley Roberts’s shaggy bob – it’s perfectly tousled – but not too perfectly – remember ‘natural’ is the word du jour. 3. If you’ve got long hair (my Cleopatra bob’s almost grown out) then you might be on the look out for a new twist. The trend that came up last year, and which is still around this summer, is literally a ‘new twist’; – the two strand braid. With the ‘two-strand’ you twist both sections three times before wrapping the hair over and securing at the bottom. And, as it’s summer and ‘natural’ is in I’d say that flowers are definitely a must. I’ve done a heap of clients this last month going to festivals who’ve left the salon looking like a right bunch of hippies. If you’re deciding on a whole new look then I can tell you some useful stuff about face shape, because, GOLDEN RULE; certain styles fit certain faces, dontcha know. The client I worked on at Aunt Lilah’s salon last Saturday (yawn) had a triangular face! Triangular! THAT is a CRIME AGAINST HAIRDRESSERS. You have to narrow the forehead and widen the chin – I did a side-swept fringe – total genius. Heart shaped faces (similar to triangular) but sweeter – a jaw length style compliments the cute pointy chin thing, and a fringe that’s cut longer at the sides is also a winner but I can’t tell you for why – I’ll have to check that out with Dariusz when he’s not scowling at me and flinging hairpins around. Square faces can come across as a bit masculine – so if you don’t want to look like Arnie Schwarzenegger, get some layers quick! Thanks for that Sadie and Ellie! Ellie has created a special hair quiz - Are you a sister of the scissors or a manic panicker? Check it out and let us know how you score!